What was the last game you bought as a physical copy? Have you bought your last boxed copy of a game? - What's the most you've spent on a game? It's off to the nostalgia well for this midweek edition of the PCG Q&A. 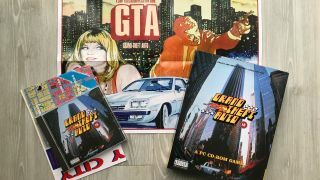 Most PC players collected physical versions of PC games back in the day, but in the last few years, thanks to digital distribution, there's been less cause to do so. There are exceptions, of course: Kickstarter campaigns often add some interesting boxed niceties and cloth maps at certain tiers, which is neat. Sometimes, too, it's weirdly cheaper to buy a game in boxed form than it is on digital platforms. Generally speaking, picking up a physical copy of a game these days generally involves stripping out the code, redeeming it through a client then having three useless discs sat in a box in your home forever. So we ask you, reader: what was the last game you bought a physical copy of? Let us know in the comments below. I miss the days of buying physical games, but the transition in the early '00s from big cardboard boxes to DVD cases spoiled some of the fun of owning physical games to me. The last one I bought was Pillars of Eternity in 2016. In the UK—like most places now, I'd assume—physical PC games are pretty hard to come across in high street stores, outside of Blizzard expansions and the odd copy of Football Manager. So I actually bought this one on eBay for less than the going price on Steam. It just happened to be in a box. Recently, though, like Andy, I've been considering picking up some old physical big box copies of PC games (my parents threw all mine out during a house move a few years ago, although I do still have a Red Alert 2 disc in a drawer somewhere). I saw the above copy of Alpha Centauri in a shop in Southampton, UK, last month on a pub crawl, and owning it seemed very exciting. If the place had still been open after my six beers, I'd have picked it up, and I've been keeping an eye on eBay ever since. I want that tech tree chart! I've also got a copy of Battleborn in my flat, still in its shrink-wrap. But I try not to think about that. Four years ago, I went to Taiwan for the first time for the PC trade show Computex. While I was there, I visited Guang Hua Digital Plaza, an amazing labyrinth of PC and game stores that puts US malls to shame. My favorite shop was wall-to-wall PC games, and I couldn't leave without buying something. I picked pretty much at random, since most of the games were in Chinese, and the game I ended up with was this one: The Legend of Fancy Realm 2. I think the translation they were looking for was fantasy realm, but let's be honest, fancy realm is way funnier. All I know about Fancy Realm is that it's an RPG. You can see a few screenshots here. It also goes by Fantasy Record 2: Devil Wars. If I ever learn Chinese, I'll have a game to play. Here's a video! I still make a point of buying games in boxes whenever possible, which these days generally means either a crowdfunding campaign or an import from Europe or Australia. Most recently, that'd be Pillars of Eternity 2. There's something about a game in a box that makes it "real," and gives it a proper place alongside all those other boxes from back in the days when driving to A+ Software was the only way to even browse games, much less buy them. Digital games, even great ones like Prey, are ephemera: played, enjoyed, maybe remembered, but never really there. I bought the boxed version of Skyrim in 2014 for cheap because I liked its map insert. Like Andy's penchant for old PC games in big cardboard boxes, I've always enjoyed physical, hold-in-yer-hand videogame maps. My passion started in the late '90s when I picked up the Ultima Collection, which came bundled with a range of gorgeous cloth charts, and grew with the first Grand Theft Auto. I've regrettably tossed most of them out since, but, lest I wander off-topic more than I already have, I still have Skyrim's—which is a total belter. Enough to make me buy its boxed version, despite already owning it on Steam. Granted, I hardly buy boxed games at all anymore—for console or PC—but I'll always be tempted by cool videogame cartography. The only image we could find of The Mystery of the Orangery, uploaded by user Jon de Ojeda on to Mobygames. Crikey. This is an adventure game. A historical adventure game based on a kind of soap-opera business plot which somehow enfolds the art of the impressionist painter Claude Monet. It is A CLASSIC. A landmark of the medium. You'll have to take my word for it because it's impossible to get the flipping thing to actually play on any modern versions of Windows, despite hours (I am not kidding) of tinkering with various backwards compatibility workarounds, compatibility mode settings, mounting the files in places and other technical things which I learned entirely for the purposes of making this purchase work. I first played Monet: The Mystery of the Orangery with my sister. I remember we had to trap a bee at one point. There was a clown! You have to avert an explosion involving sticks of dynamite! Also someone with a broad West Country accent welcomed us to Normandy! Struck by the urge to revisit this mangled idea and see whether I was at least quoting it correctly, I impulse-bought a copy online. The most I have managed to do is extract the sound files and listen to them on repeat. And believe me, I have tried. I tried to pass it off as a legitimate work activity and roped several former colleagues into trying to help me. We managed to get the thing as far as the first menu and no further. But I will not surrender. Some day, somehow I will... defeat impressionism? Big oil? Whatever it was that the game involved, I will do it. I'm actually quite proud of my last physical PC game purchase because it demonstrates how clever 23-year-old-and-very-poor me was. See, years earlier, while working at a games store, I had discovered a little tactic that allowed me to purchase relatively expensive games for much cheaper. This is how it works: a retailer is having a promotion where a normally full-priced game is discounted but every other retailer has it for full price. We'll call this discounted game Game A. What I really want, however, is fully priced Game B, which just launched and likely won't have any discounts for quite a while. So what do I do? I buy Game A at a discount at this retailer, head to another retailer across town and tell them, "Oh sorry, I got this game as a gift and don't have the receipt. Can I exchange it?" Because the second retailer doesn't have the game on discount, its value just shot back up to full price, so I exchange it for Game B and just saved myself a bunch of money. So I did something similar when [REDACTED]* was having a ridiculous promotion where if you traded in enough old generation console games, you could get a next-gen game like Battlefield 4 for free. I had a ton of old PS3 games, so I traded them in for Battlefield 4 on PS4. The only thing was I didn't have a PS4 at the time. So then I sauntered on over to [REDACTED]** across the street and asked to exchange it for Battlefield 4 for PC. Boom. The last physical game I bought for PC was only because I found a stupid loophole to exploit. * We removed the name of this retailer to keep Steven out of trouble, and because we don't want to endorse his behavior. My girlfriend just bought Lego Marvel Super Heroes 2 so we could play it together. It came in a DVD case and I was a bit worried because I don't have a disc drive any more. But the case doesn't have a DVD in it, even though it's got one of those holders for one. There's just a piece of paper with a Steam key. It's such a waste. You could fit that on a business card and instead they sell these lumps of hollow plastic because it's presumably more cost-effective than changing how game production and retail work. Capitalism is ridiculous. Maybe I'm spoiled. The last one I got was The Witcher 3 in a box set that came with a fold-out map, a CD with the soundtrack, a manual, a "Witcher Universe Compendium", and two stickers. I will never use the stickers but it felt like it was worth getting an actual thing to put on a shelf so everyone can see I'm a dork. I used to hoard my game boxes when I was younger—back in the good old days of DOS and Windows 3.x. Even into my college years in the '90s, I had a fairly large collection of game boxes. I also hated having to dig out the proper CD/DVD every time I wanted to play a game, and I experienced more than a few scratched discs that caused the game to become unplayable (until no-CD cracks became more readily available). These days, my box collections has been greatly reduced to only a handful of games, none of which have been played in the past five years. Looking at the remains of my once proud collection, my last physical game box is from Empire: Total War, which came out in March 2009. It also sports the now-defunct Games for Windows logo, bad software I'm glad is gone. I've kept the original Assassin's Creed Director's Cut and Sins of a Solar Empire boxes as well, which came out in 2008.